Powered by their passion for sound, noted touch guitarist and looper Markus Reuter along with storied electronic musician Ian Boddy, craft disparate influences into a seamless work. Their album Pure (55'35") contains 11 studio realizations characterized by faceted rhythms, strange modulations, harmonious melodies and unfolding sonic atmospheres. Whether it's unstructured floating layers of repeating chords or the interlaced rhythms of popping synthesizer tones and plucked strings grounded to tumbling electronic percussion, each piece develops rapidly and represents an elegant synthesis of the human and the technological. Their sounds positively glow as every tingling detail is meant to stimulate the imagination. The duo embraces themes of machinery and power as well as the streamlined classic motifs of Ambient Music. 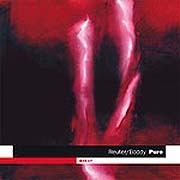 Pure's success lies in the psychological drama between Boddy's writhing, gritty rhythms and treatments and Reuter's ethereal and blessed textures and melodies. Such variety makes their music hard to define, but this kind of holistic approach can only come from artists with maturity gained through years of experience. However, the ability to apply this knowledge in inventing the future can come only from a spiritual component. Is this the next stylistic rage? It'd be nice if it was. This music is not about conquering an audience; this music is for a world seeking nuance in art and substance in its purveyors.